This document outlines how to deploy Red Hat Hyperconverged Infrastructure for Virtualization (RHHI for Virtualization) across three physical machines, using Red Hat Gluster Storage 3.4 and Red Hat Virtualization 4.2. This creates a discrete cluster for use in remote office branch office (ROBO) environments, where a remote office synchronizes data to a central data center on a regular basis, but can remain fully functional if connectivity to the central data center is lost. Red Hat Hyperconverged Infrastructure for Virtualization (RHHI for Virtualization) combines compute, storage, networking, and management capabilities in one deployment. 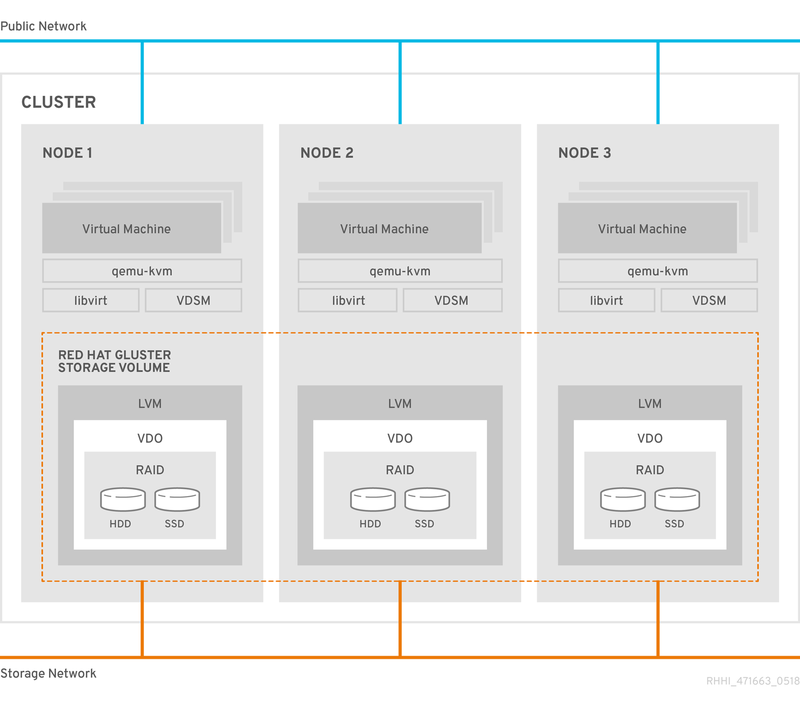 RHHI for Virtualization is deployed across three physical machines to create a discrete cluster or pod using Red Hat Gluster Storage 3.4 and Red Hat Virtualization 4.2. The dominant use case for this deployment is in remote office branch office (ROBO) environments, where a remote office synchronizes data to a central data center on a regular basis, but does not require connectivity to the central data center to function. The following diagram shows the basic architecture of a single cluster. 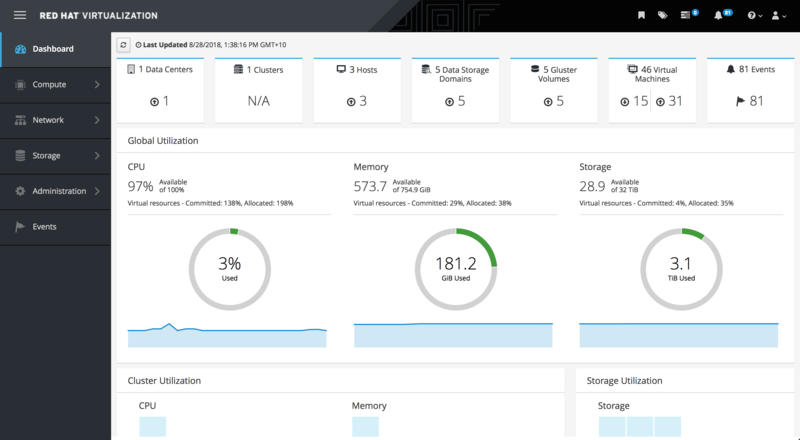 As of Red Hat Hyperconverged Infrastructure for Virtualization 1.5, you can configure a Virtual Data Optimizer (VDO) layer to provide data reduction and deduplication for your storage. VDO is supported only when enabled on new installations at deployment time, and cannot be enabled on deployments upgraded from earlier versions of RHHI for Virtualization. Additionally, thin provisioning is not currently compatible with VDO. These two technologies are not supported on the same device. VDO performs following types of data reduction to reduce the space required by data. Eliminates zero and duplicate data blocks. VDO finds duplicated data using the UDS (Universal Deduplication Service) Kernel Module. Instead of writing the duplicated data, VDO records it as a reference to the original block. The logical block address is mapped to the physical block address by VDO. Reduces the size of the data by packing non-duplicate blocks together into fixed length (4 KB) blocks before writing to disk. This helps to speed up the performance for reading data from storage. At best, data can be reduced to 15% of its original size. Because reducing data has additional processing costs, enabling compression and deduplication reduces write performance. As a result, VDO is not recommended for performance sensitive workloads. Red Hat strongly recommends that you test and verify that your workload achieves the required level of performance with VDO enabled before deploying VDO in production. Red Hat Hyperconverged Infrastructure for Virtualization (RHHI for Virtualization) uses Red Hat Virtualization Host 4.2 as a base for all other configuration. The following table shows the the supported versions of each product to use for a supported RHHI for Virtualization deployment. See Requirements in the Red Hat Virtualization Planning and Prerequisites Guide for details on requirements of Red Hat Virtualization. Red Hat Hyperconverged Infrastructure for Virtualization (RHHI for Virtualization) requires at least 3 physical machines. Scaling to 6, 9, or 12 physical machines is also supported; see Scaling for more detailed requirements. For more information, see Requirements in the Red Hat Virtualization 4.2 Planning and Prerequisites Guide. Fully-qualified domain names that are forward and reverse resolvable by DNS are required for all hyperconverged hosts and for the Hosted Engine virtual machine that provides Red Hat Virtualization Manager. Client storage traffic and management traffic in the cluster must use separate networks: a front-end management network and a back-end storage network. Each node requires two Ethernet ports, one for each network. This ensures optimal performance. For high availability, place each network on a separate network switch. For improved fault tolerance, provide a separate power supply for each switch. Used by Red Hat Virtualization and virtual machines. Requires at least one 1Gbps Ethernet connection. IP addresses assigned to this network must be on the same subnet as each other, and on a different subnet to the back-end storage network. IP addresses on this network can be selected by the administrator. Used by storage and migration traffic between hyperconverged nodes. Requires at least one 10Gbps Ethernet connection. Requires maximum latency of 5 milliseconds between peers. Network fencing devices that use Intelligent Platform Management Interfaces (IPMI) require a separate network. 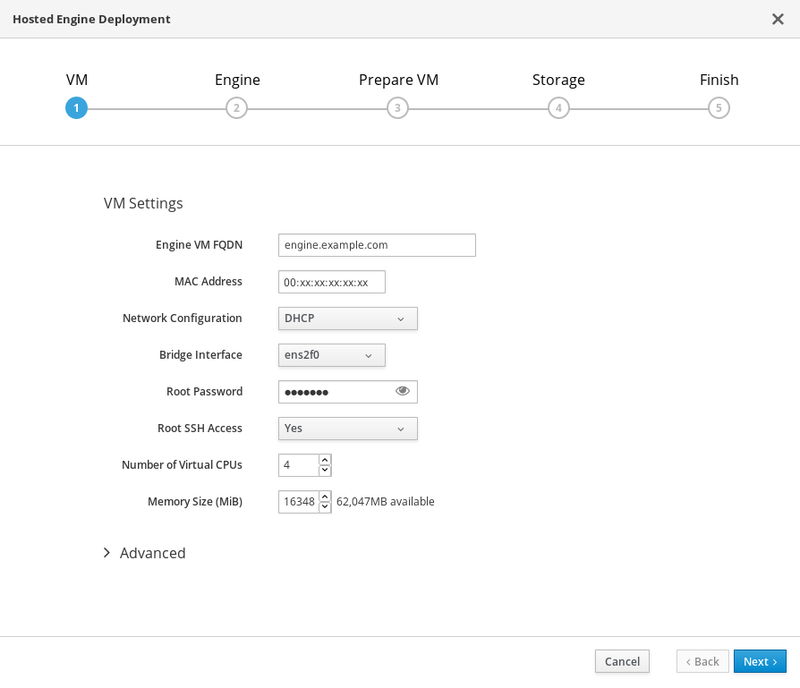 If you want to use DHCP network configuration for the Hosted Engine virtual machine, then you must have a DHCP server configured prior to configuring Red Hat Hyperconverged Infrastructure for Virtualization. IP address for a gateway to the virtualization host. This address must respond to ping requests. IP address of the front-end management network. 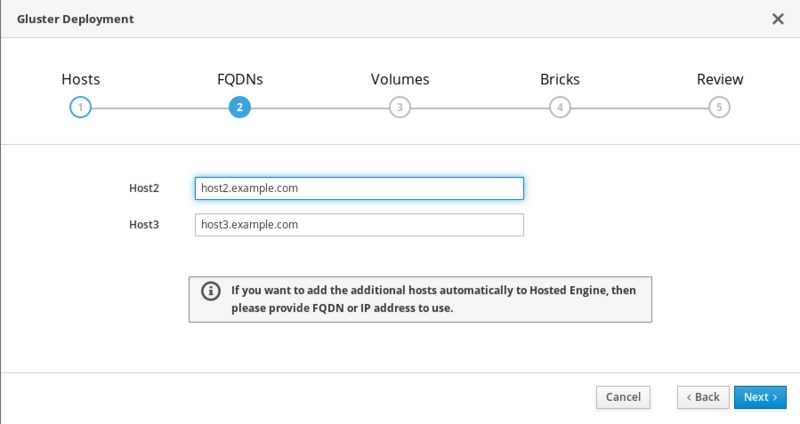 Fully-qualified domain name (FQDN) for the Hosted Engine virtual machine. MAC address that resolves to the static FQDN and IP address of the Hosted Engine. A hyperconverged host stores configuration, logs and kernel dumps, and uses its storage as swap space. This section lists the minimum directory sizes for hyperconverged hosts. Red Hat recommends using the default allocations, which use more storage space than these minimums. Anaconda reserves 20% of the thin pool size within the volume group for future metadata expansion. This is to prevent an out-of-the-box configuration from running out of space under normal usage conditions. Overprovisioning of thin pools during installation is also not supported. Red Hat recommends Solid State Disks (SSDs) for best performance. If you use Hard Drive Disks (HDDs), you should also configure a smaller, faster SSD as an LVM cache volume. 4K native devices are not supported with Red Hat Hyperconverged Infrastructure for Virtualization, as Red Hat Virtualization requires 512 byte emulation (512e) support. RAID5 and RAID6 configurations are supported. However, RAID configuration limits depend on the technology in use. 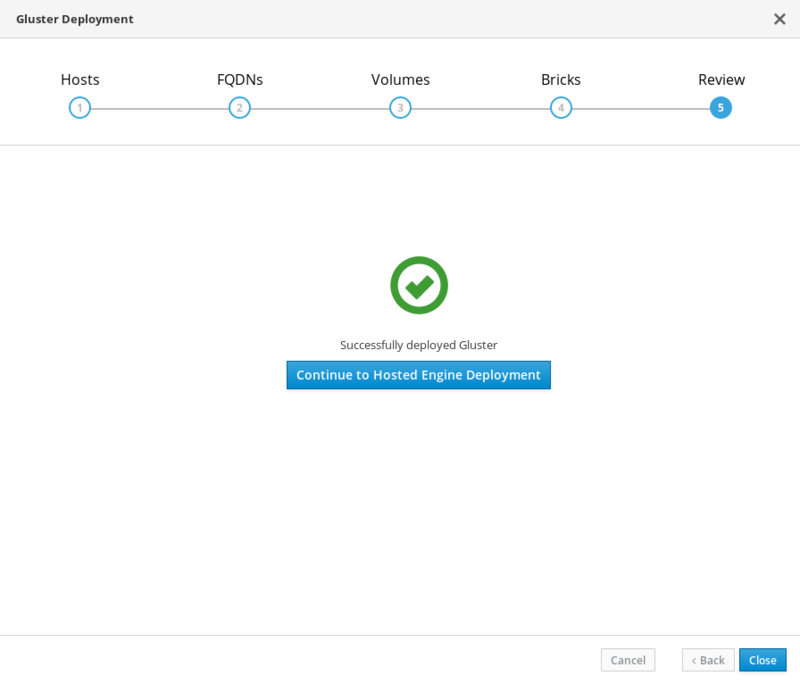 As of Red Hat Hyperconverged Infrastructure for Virtualization 1.5, JBOD configurations are fully supported and no longer require architecture review. When VDO is not in use, the logical volumes that comprise the vmstore and optional data gluster volumes must be thin provisioned. This allows greater flexibility in underlying volume configuration. If your thin provisioned volumes are on Hard Drive Disks (HDDs), configure a smaller, faster Solid State Disk (SSD) as an lvmcache for improved performance. Thin provisioning is not required for the vmstore and data volumes if VDO is being used on these volumes. Red Hat Hyperconverged Infrastructure for Virtualization is expected to have 3–4 Red Hat Gluster Storage volumes. A Red Hat Hyperconverged Infrastructure for Virtualization deployment can contain at most 1 geo-replicated volume. Replicated volumes (3 copies of the same data on 3 bricks, across 3 nodes). Arbitrated replicated volumes (2 full copies of the same data on 2 bricks and 1 arbiter brick that contains metadata. across three nodes). Distributed volumes (1 copy of the data, no replication to other bricks). All replicated and arbitrated-replicated volumes must span exactly three nodes. Note that arbiter bricks store only file names, structure, and metadata. This means that a three-way arbitrated replicated volume requires about 75% of the storage space that a three-way replicated volume would require to achieve the same level of consistency. However, because the arbiter brick stores only metadata, a three-way arbitrated replicated volume only provides the availability of a two-way replicated volume. For more information on laying out arbitrated replicated volumes, see Creating multiple arbitrated replicated volumes across fewer total nodes in the Red Hat Gluster Storage Administration Guide. A Virtual Data Optimizer (VDO) layer is supported as of Red Hat Hyperconverged Infrastructure for Virtualization 1.5. VDO is supported only on new deployments. VDO is compatible only with thick provisioned volumes. VDO and thin provisioning are not supported on the same device. Initial deployments of Red Hat Hyperconverged Infrastructure for Virtualization are either 1 node or 3 nodes. 1 node deployments cannot be scaled. Add new hyperconverged nodes to the cluster, in sets of three, up to the maximum of 12 hyperconverged nodes. Create new Gluster volumes using new disks on existing hyperconverged nodes. You cannot create a volume that spans more than 3 nodes, or expand an existing volume so that it spans across more than 3 nodes at a time. Red Hat Hyperconverged Infrastructure for Virtualization is supported only when deployed as specified in this document. Existing Red Hat Gluster Storage configurations cannot be used in a hyperconverged configuration. If you want to use an existing Red Hat Gluster Storage configuration, refer to the traditional configuration documented in Configuring Red Hat Virtualization with Red Hat Gluster Storage. Red Hat strongly recommends configuring a disaster recovery solution. For details on configuring geo-replication as a disaster recovery solution, see Maintaining Red Hat Hyperconverged Infrastructure for Virtualization: https://access.redhat.com/documentation/en-us/red_hat_hyperconverged_infrastructure_for_virtualization/1.5/html/maintaining_red_hat_hyperconverged_infrastructure_for_virtualization/config-backup-recovery. Red Hat Hyperconverged Infrastructure for Virtualization (RHHI for Virtualization) supports only one geo-replicated volume. Red Hat recommends backing up the volume that stores the data of your virtual machines, as this is usually contains the most valuable data. Ensure that the primary and secondary environments have the same version of Red Hat Virtualization Manager, with identical data center compatibility versions, cluster compatibility versions, and PostgreSQL versions. The storage domain used by the hosted engine virtual machine is not failed over, so any virtual machine disks in this storage domain will be lost. Generate and execute Ansible playbooks manually from a separate machine that acts as an Ansible master node. Red Hat Hyperconverged Infrastructure for Virtualization is supported for deployment on a single node provided that all Support Requirements are met, with the following additions and exceptions. Single node deployments cannot be scaled, and are not highly available. Verify that your planned deployment meets support requirements: Chapter 2, Support requirements. Install the physical machines that will act as virtualization hosts: Chapter 4, Install Host Physical Machines. Configure key-based SSH authentication without a password to enable automated configuration of the hosts: Chapter 5, Configure Public Key based SSH Authentication without a password. 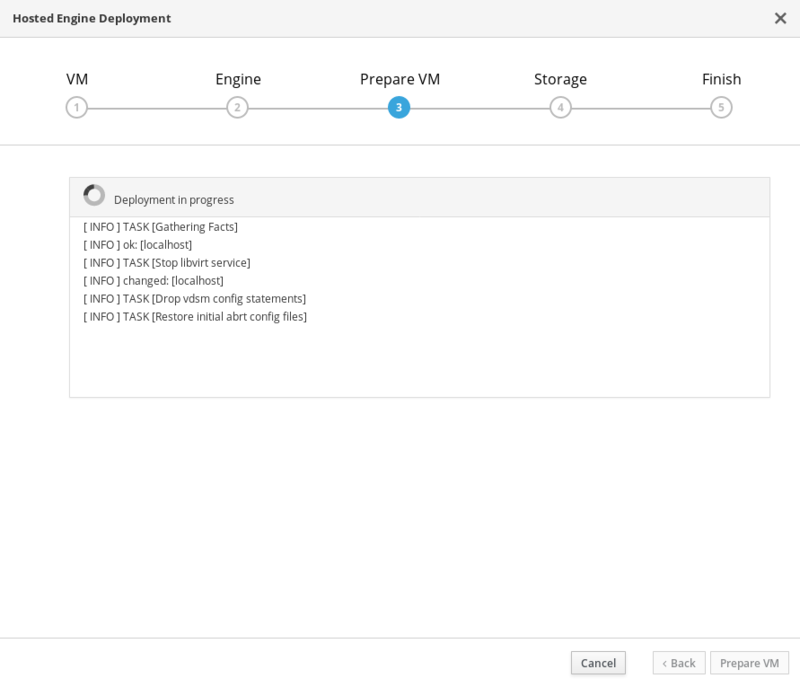 Configure Red Hat Gluster Storage on the physical hosts using the Cockpit UI: Chapter 6, Configure Red Hat Gluster Storage for Hosted Engine using the Cockpit UI. 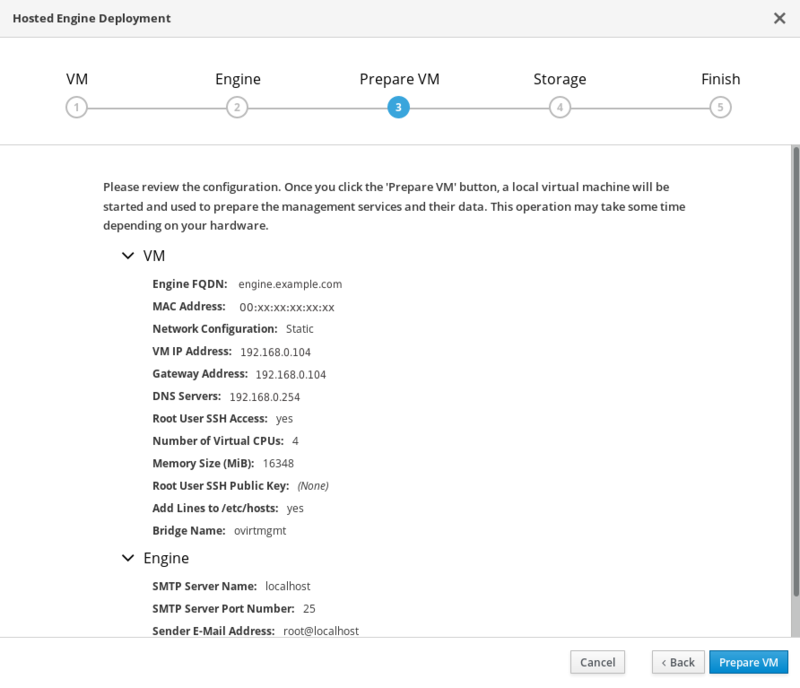 Deploy the Hosted Engine using the Cockpit UI: Chapter 7, Deploy the Hosted Engine using the Cockpit UI. 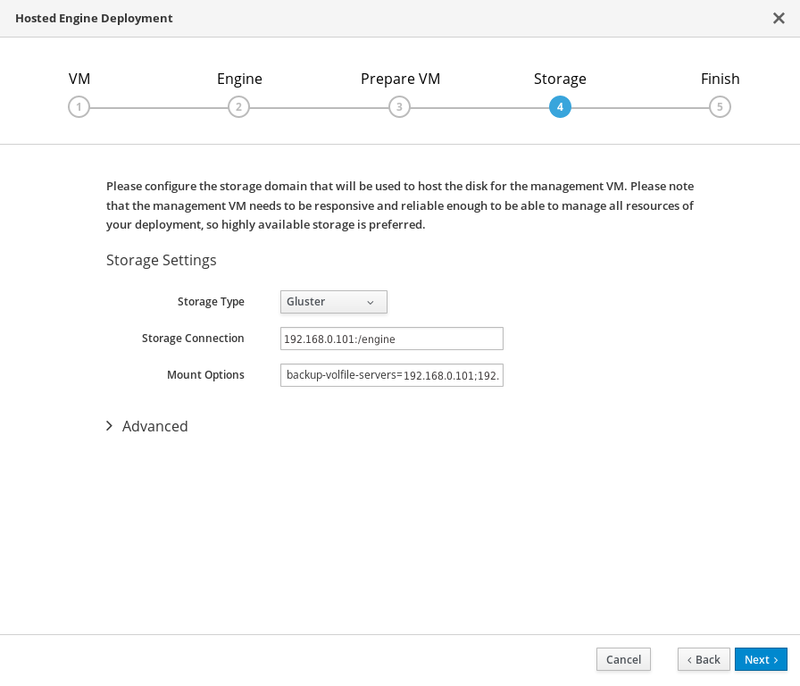 Configure the Red Hat Gluster Storage nodes using the Red Hat Virtualization management UI: Log in to Red Hat Virtualization Manager to complete configuration. 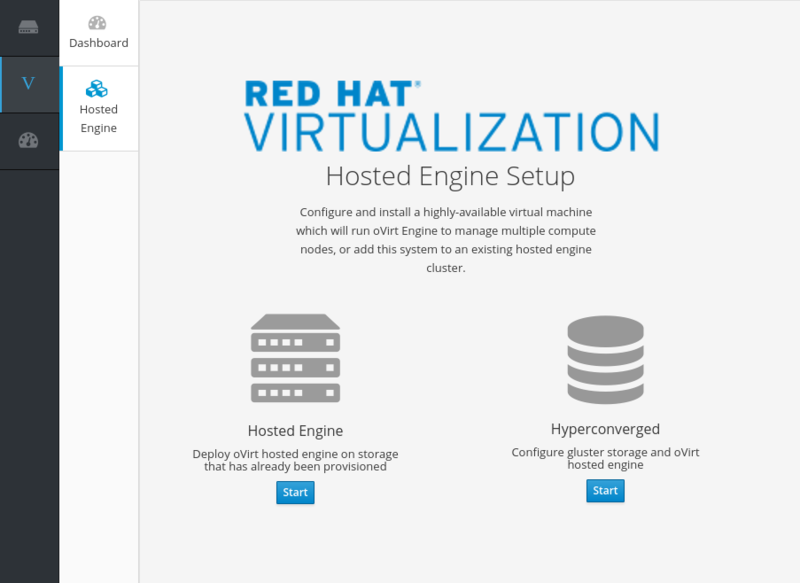 Install Red Hat Virtualization Host 4.2 on your three physical machines. 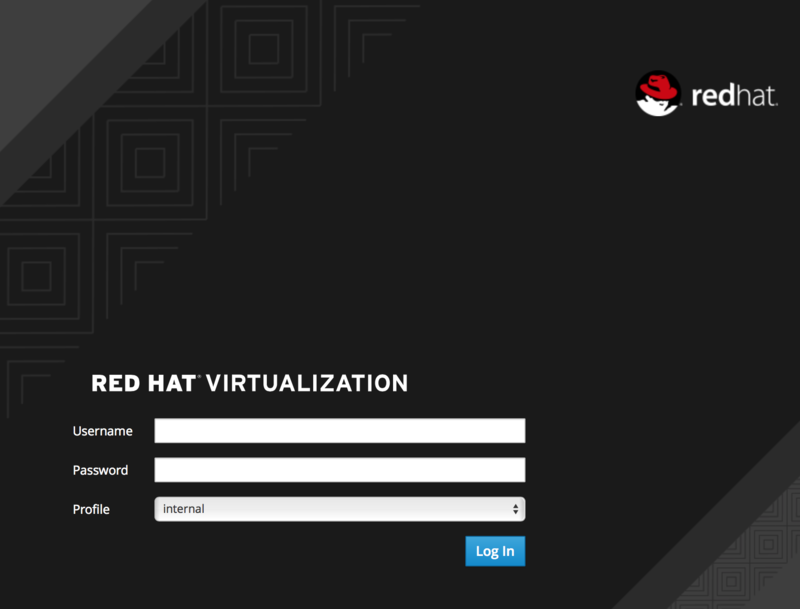 See the following section for details about installing a virtualization host: https://access.redhat.com/documentation/en-us/red_hat_virtualization/4.2/html/installation_guide/red_hat_virtualization_hosts. Increase the size of /var/log to 15GB to provide sufficient space for the additional logging requirements of Red Hat Gluster Storage. Configure public key based SSH authentication without a password for the root user on the first virtualization host to all hosts, including itself. Do this for all storage and management interfaces, and for both IP addresses and FQDNs. See the Red Hat Enterprise Linux 7 Installation Guide for more details: https://access.redhat.com/documentation/en-US/Red_Hat_Enterprise_Linux/7/html/System_Administrators_Guide/s1-ssh-configuration.html#s2-ssh-configuration-keypairs. Browse to the Cockpit management interface of the first virtualization host, for example, https://node1.example.com:9090/, and log in with the credentials you created in Chapter 4, Install Host Physical Machines. Click Virtualization → Hosted Engine and click Start underneath Hyperconverged. The Gluster Configuration window opens. Click the Run Gluster Wizard button. The Gluster Deployment window opens in 3 node mode. Specify the back-end FQDNs on the storage network (not the management network) of the three virtualization hosts. The virtualization host that can SSH using key pairs should be listed first, as it is the host that will run gdeploy and the hosted engine. For multi-node deployments, add the fully qualified domain names or IP addresses of the other two virtualization hosts to have them automatically added to Red Hat Virtualization Manager when deployment is complete. If you do not add additional hosts now, you can also add them after deployment using Red Hat Virtualization Administration Portal, as described in Add additional virtualization hosts to the hosted engine. Specify the volumes to create. Enter details of the bricks to be created. Use the Select host drop-down menu to change the host being configured. Specify the RAID configuration to use. This should match the RAID configuration of your host. Supported values are raid5, raid6, and jbod. Setting this option ensures that your storage is correctly tuned for your RAID configuration. Specify the size of the logical volume to create in GB. Do not enter units, only the number. This number should be the same for all bricks in a replicated set. Arbiter bricks can be smaller than other bricks in their replication set. Specify the mount point for the logical volume. This should be inside the brick directory that you specified on the previous page of the wizard. Specify whether to provision the volume thinly or not. Note that thick provisioning is recommended for the engine volume. Do not use Enable Dedupe & Compression at the same time as this option. Specify whether to provision the volume using VDO for compression and deduplication at deployment time. Do not use Thinp at the same time as this option. Specify the logical size of the VDO volume. This can be up to 10 times the size of the physical volume, with an absolute maximum logical size of 4 PB. Click Edit to begin editing the generated deployment configuration file. If the configuration details are correct, click Save and then click Deploy. The window displays Successfully deployed gluster when complete. 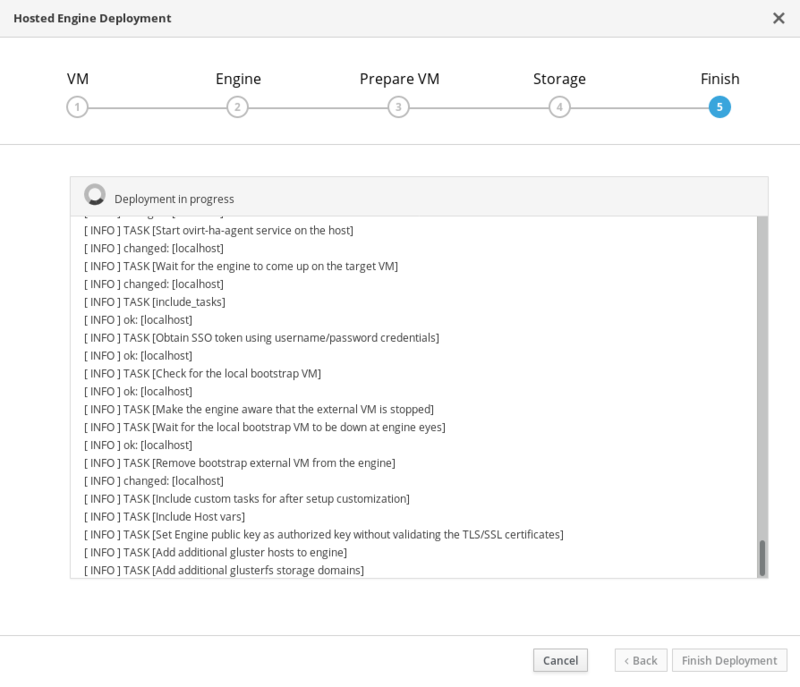 Click Continue to Hosted Engine Deployment and continue the deployment process with the instructions in Chapter 7, Deploy the Hosted Engine using the Cockpit UI. It may be necessary to clean up previous deployment attempts before you try again. Follow the steps in Chapter 13, Cleaning up automated Red Hat Gluster Storage deployment errors to clean up previous deployment attempts. 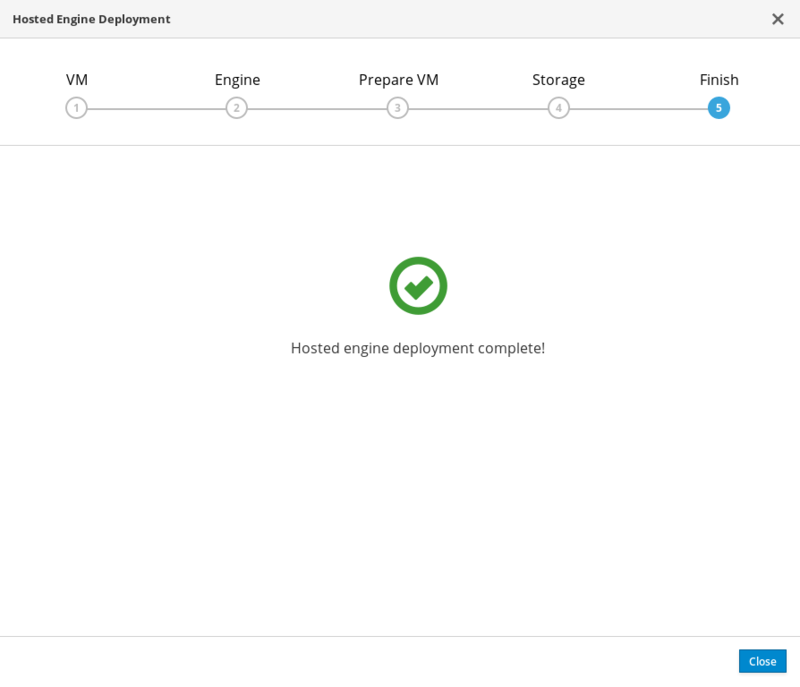 This procedure assumes that you have continued directly from the end of Configure Red Hat Gluster Storage for Hosted Engine using the Cockpit UI. Have the following information ready before you start the deployment process. The fully qualified domain name to be used for the Hosted Engine virtual machine. The MAC address associated with the FQDN to be used for the Hosted Engine virtual machine. The root password to be used for the Hosted Engine virtual machine. 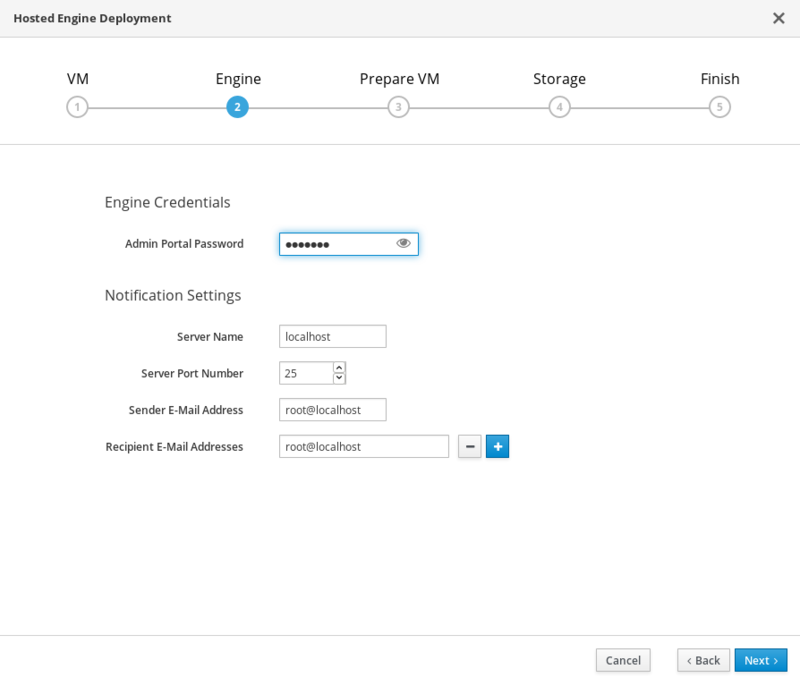 Enter the password to be used by the admin account in Red Hat Virtualization Manager. You can also specify notification behaviour here. Ensure that the details listed on this tab are correct. Click Back to correct any incorrect information. Wait for virtual machine preparation to complete. If preparation does not occur successfully, see Viewing Hosted Engine deployment errors. Specify the primary host and the location of the engine volume, and ensure that the backup-volfile-servers values listed in Mount Options are the IP addresses of the additional virtualization hosts. Review your deployment details and verify that they are correct. The responses you provided during configuration are saved to an answer file to help you reinstall the hosted engine if necessary. The answer file is created at /etc/ovirt-hosted-engine/answers.conf by default. This file should not be modified manually without assistance from Red Hat Support. This takes up to 30 minutes. The window displays the following when complete. If deployment does not complete successfully, see Viewing Hosted Engine deployment errors. Browse to the engine user interface (for example, http://engine.example.com/ovirt-engine) and verify that you can log in using the administrative credentials you configured earlier. Click Dashboard and look for your hosts, storage domains, and virtual machines. Log in to Red Hat Virtualization Manager to complete configuration. Browse to the engine user interface (for example, http://engine.example.com/ovirt-engine) and log in using the administrative credentials you configured in Chapter 7, Deploy the Hosted Engine using the Cockpit UI. Click Network → Networks and then click New. The New Logical Network wizard appears. Click the Network → Networks and select the new logical network. Click the Clusters subtab and then click Manage Network. The Manage Network dialogue appears. Click the Network Interfaces subtab and then click Setup Host Networks. The Setup Host Networks window opens. Ensure that the Verify connectivity between Host and Engine checkbox is checked. Check the state of the host’s network. If the network interface enters an "Out of sync" state or does not have an IPv4 Address, click Management → Refresh Capabilities. 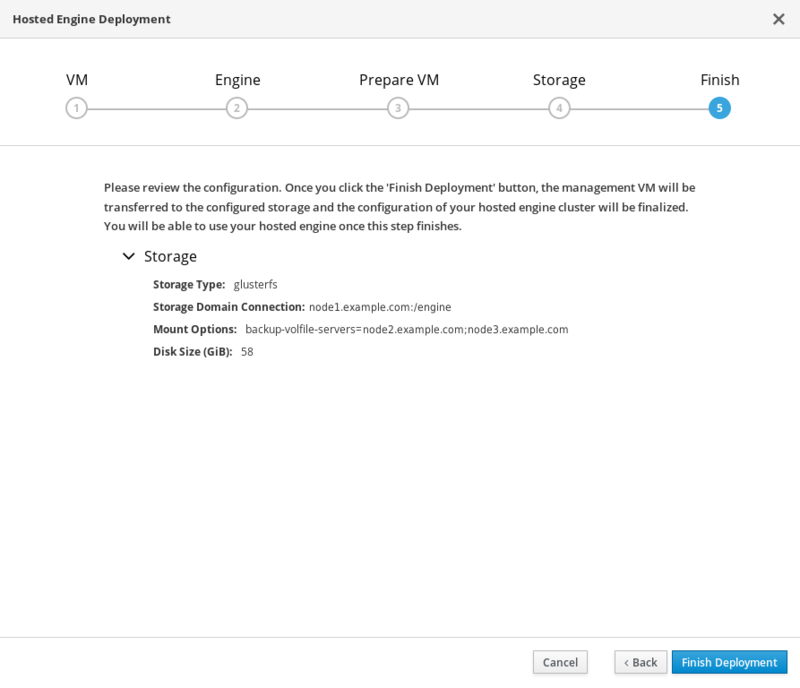 If you did not specify additional virtualization hosts as part of Configure Red Hat Gluster Storage for Hosted Engine using the Cockpit UI, follow these steps in Red Hat Virtualization Manager for each of the other virtualization hosts. Click Compute → Hosts and then click New to open the New Host window. Provide the Name, Hostname, and Password for the host that you want to manage. Click the name of the newly added host to go to the host page. If Score is listed as N/A, you may have forgotten to select the deploy action for Choose hosted engine deployment action. 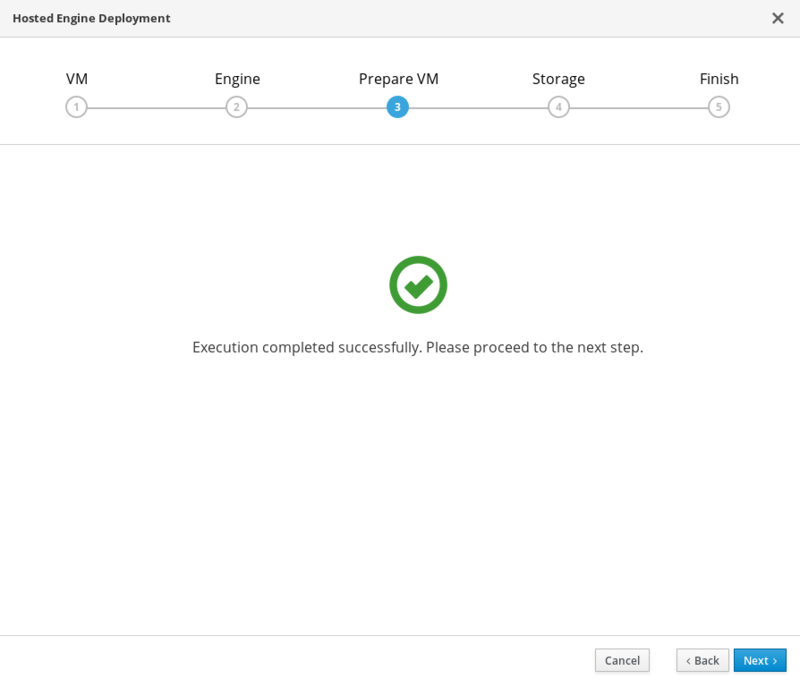 Follow the steps in Reinstalling a virtualization host in Maintaining Red Hat Hyperconverged Infrastructure for Virtualization to reinstall the host with the deploy action. After deployment is complete, verify that your deployment has completed successfully. Browse to the engine user interface, for example, http://engine.example.com/ovirt-engine. Log in using the administrative credentials added during hosted engine deployment. When login is successful, the Dashboard appears. Verify that your cluster is available. Verify that at least one host is available. If you provided additional host details during Hosted Engine deployment, 3 hosts are visible here, as shown. Verify that all hosts are listed with a Status of Up. Verify that all storage domains are available. Verify that the Active icon is shown in the first column. Depending on your requirements, you may want to perform some additional configuration on your newly deployed Red Hat Hyperconverged Infrastructure for Virtualization. This section contains suggested next steps for additional configuration. Details on these processes are available in Maintaining Red Hat Hyperconverged Infrastructure for Virtualization. If your main storage devices are not Solid State Disks (SSDs), Red Hat recommends configuring a logical volume cache (lvmcache) to achieve the required performance for Red Hat Hyperconverged Infrastructure for Virtualization deployments. See Configuring a logical volume cache for improved performance for details. Fencing allows a cluster to enforce performance and availability policies and react to unexpected host failures by automatically rebooting virtualization hosts. See Configure High Availability using fencing policies for further information. Red Hat recommends configuring at least basic disaster recovery capabilities on all production deployments. See Configuring backup and recovery options in Maintaining Red Hat Hyperconverged Infrastructure for Virtualization for more information. During the deployment process, progress information is displayed in the web browser. This information is also stored on the local file system so that the information logged can be archived or reviewed at a later date, for example, if the web browser stops responding or is closed before the information has been reviewed. The log file for the Cockpit based deployment process (documented in Chapter 6, Configure Red Hat Gluster Storage for Hosted Engine using the Cockpit UI) is stored in the ~/.gdeploy/logs/gdeploy.log file, where ~ is the home directory of the administrative user logged in to the Cockpit UI. If you log in to the Cockpit UI as root, the log file is stored as /root/.gdeploy/logs/gdeploy.log. The log files for the Hosted Engine setup portion of the deployment process (documented in Chapter 7, Deploy the Hosted Engine using the Cockpit UI) are stored in the /var/log/ovirt-hosted-engine-setup directory, with file names of the form ovirt-hosted-engine-setup-<date>.log. Review the output, and click Back to correct any entered values and try again. Contact Red Hat Support with details of errors for assistance in correcting them. Review the output for error information. Click Back to correct any entered values and try again. If deployment failed after the physical volume or volume group were created, you must also follow the steps in Chapter 13, Cleaning up automated Red Hat Gluster Storage deployment errors to return your system to a fresh state for the deployment process. If you need help resolving errors, contact Red Hat Support with details. If the deployment process fails after the physical volumes and volume groups are created, you need to undo that work to start the deployment from scratch. Follow this process to clean up a failed deployment so that you can try again. Ensure that you have appropriate certificates signed by a Certificate Authority before proceeding. Obtaining certificates is outside the scope of this document. Ensure that the following files exist in the following locations on all nodes. The certificate signed by the Certificate Authority, which becomes the node’s certificate. The Certificate Authority’s certificate. For self-signed configurations, this file contains the concatenated certificates of all nodes. Create the /var/lib/glusterd/secure-access file on each node. 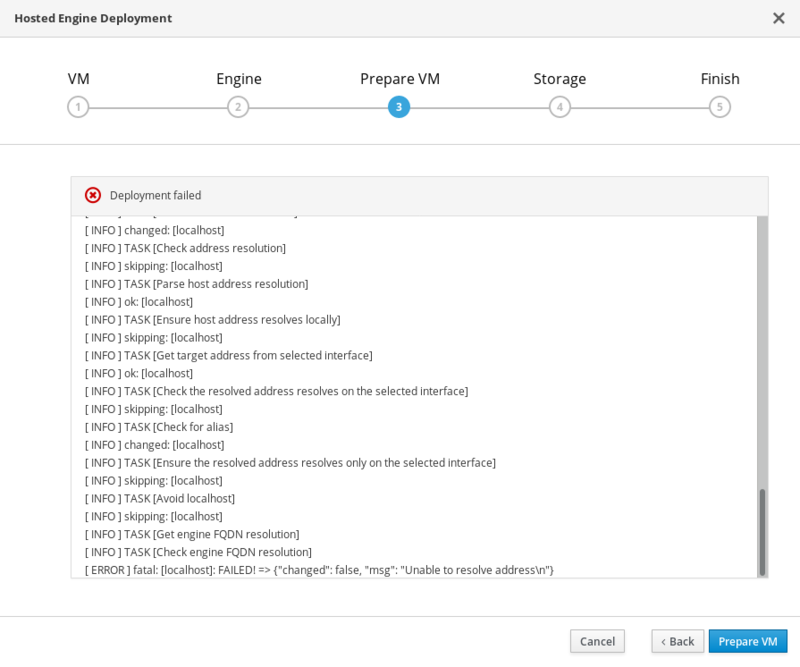 Add the following lines to each volume listed in the configuration file generated as part of Chapter 6, Configure Red Hat Gluster Storage for Hosted Engine using the Cockpit UI. This creates and configures TLS/SSL based encryption between gluster volumes using CA-signed certificates as part of the deployment process. Ensure that you save the generated file after editing. Add the following lines to the configuration file generated in Chapter 6, Configure Red Hat Gluster Storage for Hosted Engine using the Cockpit UI to create and configure TLS/SSL based encryption between gluster volumes using self signed certificates as part of the deployment process. Certificates generated by gdeploy are valid for one year. In the event that deployment fails, it is necessary to clean up the previous deployment attempts before retrying the deployment. The following two example files can be run with gdeploy to clean up previously failed deployment attempts so that deployment can be reattempted. Gdeploy automatically provisions one or more machines with Red Hat Gluster Storage based on a configuration file. 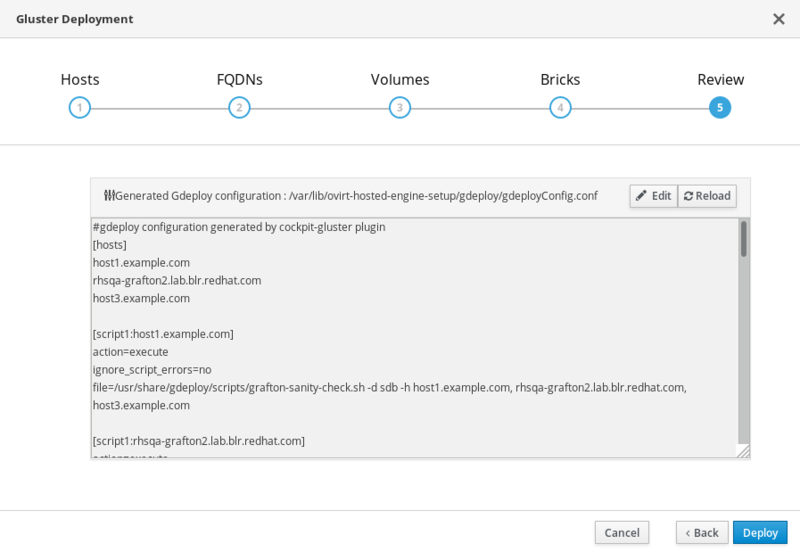 The Cockpit UI provides provides a wizard that allows users to generate a gdeploy configuration file that is suitable for performing the base-level deployment of Red Hat Hyperconverged Infrastructure for Virtualization. Arbiter configuration for non-engine volumes. Three-way replication for the engine volume. 12 bricks that are configured with RAID 6 with a stripe size of 256 KB. This results in a gdeploy configuration file with the following sections. For further details on any of the sections defined here, see the Red Hat Gluster Storage Administration Guide: https://access.redhat.com/documentation/en-us/red_hat_gluster_storage/3.4/html/administration_guide/chap-red_hat_storage_volumes#chap-Red_Hat_Storage_Volumes-gdeploy_configfile. The [hosts] section defines the IP addresses of the three physical machines to be configured according to this configuration file. The [script1] section specifies a script to run to verify that all hosts are configured correctly in order to allow gdeploy to run without error. The [disktype] section specifies the hardware configuration of the underlying storage for all hosts. The [diskcount] section specifies the number of disks in RAID storage. This can be omitted for JBOD configurations. The [stripesize] section specifies the RAID storage stripe size in kilobytes. This can be omitted for JBOD configurations. These service sections enable and restart the network time service, chronyd, on all servers. The [pv1] section creates a physical volume on the sdb device of all hosts. If you enable dedeuplication and compression during deployment time, devices in [pv1] and pvname in [vg1] will be /dev/mapper/vdo_sdb. For more information on VDO configuration, see Appendix D, Example gdeploy configuration file for configuring compression and deduplication. The [vg1] section creates a volume group in the previously created physical volume on all hosts. The [lv1:*] section creates a 1000 GB thin pool on the first two hosts with a meta data pool size of 16 GB. The [lv2:*] section creates a 20 GB thin pool on the third host with a meta data pool size of 16 GB. This is the logical volume used for the arbiter brick. The chunksize variable is also available, but should be used with caution. chunksize defines the size of the chunks used for snapshots, cache pools, and thin pools. By default this is specified in kilobytes. For RAID 5 and 6 volumes, gdeploy calculates the default chunksize by multiplying the stripe size and the disk count. Red Hat recommends using at least the default chunksize. If the chunksize is too small and your volume runs out of space for metadata, the volume is unable to create data. Red Hat recommends monitoring your logical volumes to ensure that they are expanded or more storage created before metadata volumes become completely full. The [lv3:*] section creates a 100 GB thick provisioned logical volume called gluster_lv_engine on the first two hosts. This volume is configured to mount on /gluster_bricks/engine. The [lv4:*] section creates a 10 GB thick provisioned logical volume for the engine on the third host. This volume is configured to mount on /gluster_bricks/engine. The [lv5:*] and [lv7:*] sections create 500 GB logical volumes as bricks for the data and vmstore volumes on the first two hosts. The [lv6:*] and [lv8:*] sections create 10 GB logical volumes as arbiter bricks for the data and vmstore volumes on the third host. The data bricks are configured to mount on /gluster_bricks/data, and the vmstore bricks are configured to mount on /gluster_bricks/vmstore. The [selinux] section specifies that the storage created should be configured with appropriate SELinux file system labels for Gluster storage. The [service3] section starts the glusterd service and configures a control group to ensure glusterd cannot consume all system resources; see the Red Hat Enterprise Linux Resource Management Guide for details: https://access.redhat.com/documentation/en-US/Red_Hat_Enterprise_Linux/7/html/Resource_Management_Guide/index.html. The [firewalld] section opens the ports required to allow gluster traffic. The [script2] section disables gluster hooks that can interfere with the Hyperconverged Infrastructure. 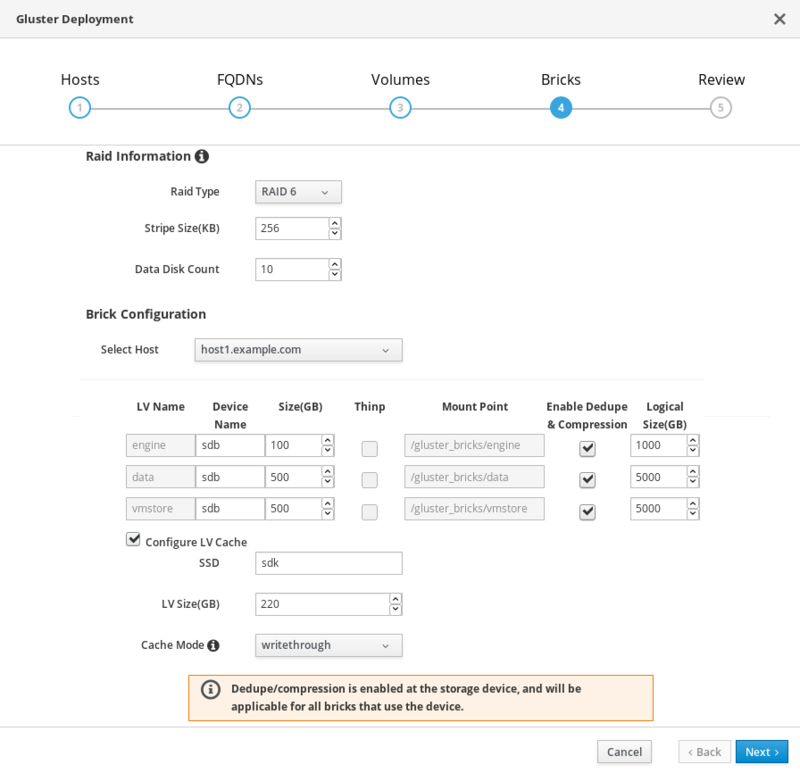 The [volume*] sections configure Red Hat Gluster Storage volumes. The [volume1] section configures one three-way replicated volume, engine. 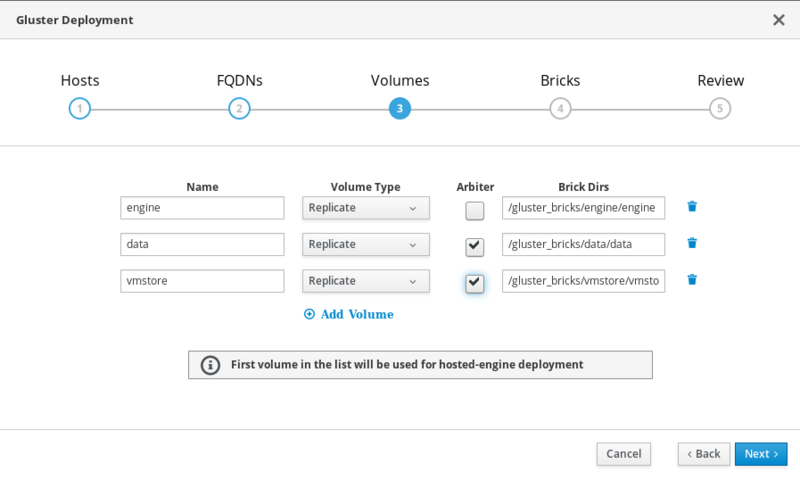 The additional [volume*] sections configure two arbitrated replicated volumes: data and vmstore, which have one arbiter brick on the third host. 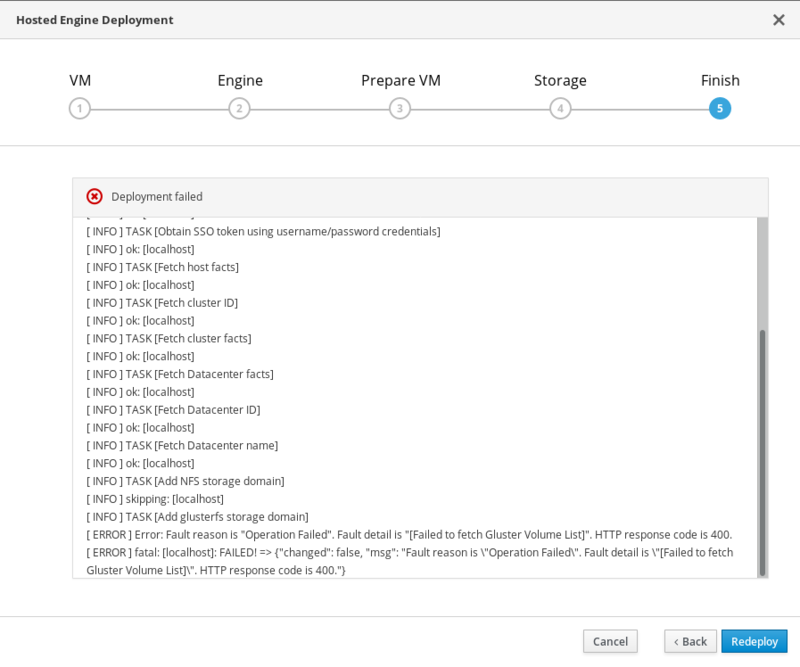 Virtual Data Optimizer (VDO) volumes are supported as of Red Hat Hyperconverged Infrastructure for Virtualization 1.5 when enabled at deployment time. VDO cannot be enabled on existing deployments. Deploying Red Hat Hyperconverged Infrastructure for Virtualization 1.5 with a Virtual Data Optimizer volume reduces the actual disk space required for a workload, as it enables data compression and deduplication capabilities. This reduces capital and operating expenses. The gdeployConfig.conf file is located at /var/lib/ovirt-hosted-engine-setup/gdeploy/gdeployConfig.conf. This configuration file is applied when Enable Dedupe & Compression is checked during deployment. # Logical size(G) is ten times of actual brick size. If logicalsize >= 1000G, then slabsize=32G.